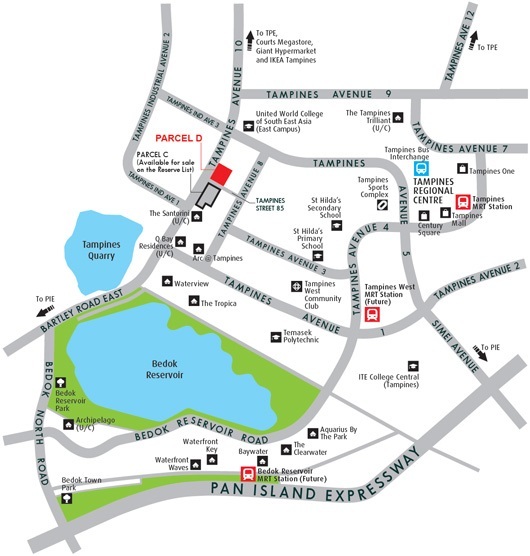 The site is conveniently linked to the city and rest of the island via major arterial roads and expressways such as Tampines Expressway and Pan Island Expressway. Residents can engage in outdoor recreation activities or enjoy a leisurely walk at Bedok Reservoir Park. SINGAPORE: A residential site at Tampines Avenue 10 drew 12 bids at the close of the auction on Tuesday (Apr 28), indicating strong demand from developers despite the soft property market. The Urban Redevelopment Authority (URA) said the 15,660.4 square metre 99-year leasehold site attracted a top bid of S$227.78 million from MCC Land (Singapore). This works out to around S$5,194.53 per square metre of gross floor area, or about S$483 per square foot. According to URA, the Tampines Avenue 10 (Parcel D) site can yield about 490 private residential units. URA had launched the site for public tender on Mar 17. URA said a decision on the award of the tender will be made at a later date after the bids have been evaluated. Register for the latest information on Tampines Avenue 10 (Parcel D) condominium by filling up your details below!